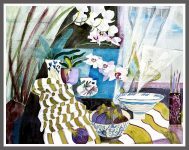 February 2019: I have an article appearing in The Artist Magazine, March 2019 Isuue entitled ‘Compositions with colour and imagination’, A MASTERCLASS in which Aileen Wrennall tells Caroline Saunders about her approach to her colourful watercolours and mixed media still lifes. October 2018: Paintings exhibited in the Autumn Exhibition of the Glasgow Society of Women Artsists, Lillie Gallery, Milngavie, Glasgow. July 2018: Paintings exhibited at the Edinburgh Central Library during the Edinburgh Festival. July 2018: Solo exhibition at the Moray Arts Centre, Findhorn, Moray Scotland. 24 paintings exhibited along with prints and cards. May 2018: Painting exhibited with the Paisley Art Institute Annual Exhibition. May 2018: Paintings exhibited with the Glasgow Society of Women Artists Spring Exhibition, Rozelle Gallery, Ayr, Scotland.